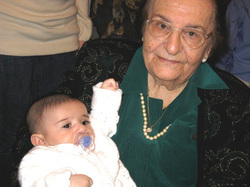 The last known Armenian Genocide survivor in the San Francisco Bay Area Takouhie Keshishian, passed away at the age 99. She passed away peacefully on February 26, 2014. She was one of the last living survivors of the 20th century’s first systematic genocide, perpetrated by the Ottoman Turkish government against its Armenian subjects, 1915 -1923, during which more than half of the Armenian population living on its ancient homeland was killed, and their personal and community properties seized. Takouhie is survived by 6 children, 16 grandchildren, and 24 great-grandchildren.